Rotational moulding, also known as rotomoulding, is a plastics moulding technology which is ideal for making hollow articles. It is a casting technic but unlike most other plastics processes there is no pressure involved. Moulds for the process are relatively inexpensive as they do not have to withstand pressure and therefore relatively short production runs can be made very economically. Rotomoulding is used to make a very diverse range of products. The process offers the product designer exceptional freedom as just about any shape can be produced. There is almost no limit to the size of mouldings and there are literally thousands of applications. For comprehensive information on the different materials that are used during rotational moulding click here. The concept of rotational moulding is very simple. A plastic material, normally in powder form is placed into a hollow mould, usually made from cast aluminium or fabricated from sheet steel. The mould is closed and rotated slowly on two axis. The mould is then heated in an oven whilst rotating and the polymer gradually melts and ‘lays-up’ on the inside of the mould. Once the polymer powder has fully melted the mould is moved to a cooling station and cooled usually with air and sometimes a fine mist of water. As the mould cools the part solidifies. When the material has finally cooled sufficiently to release away from the mould surface the process is stopped and the product is taken out of the mould (de-moulded). 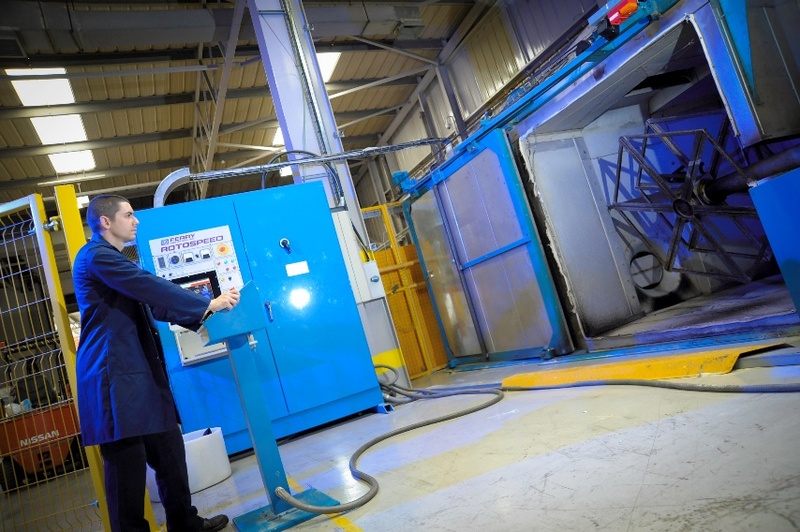 Whilst the concept of rotational moulding is extremely simple anyone who has ever been involved in the process will tell you that it is in fact extremely complicated. It is a casting process and there is normally no pressure involved which means that the material cannot be controlled in the same way as high pressure processes such as injection moulding. There are many variables that can affect production and the end product such as ambient temperature and humidity, type of mould, material specification and powder quality. Today the industry is heavily dependent on Polyethylene (PE) and 97% of rotomoulded products are made from this material. Polyethylene is a versatile, easily mouldable and readily available polymer which has come to dominate the process. Rotomoulding is a casting technique in which powder is nearly always used rather than granules, meaning the material must be ground. Polyethylene is relatively easy to grind at ambient temperatures. The development of other polymers has been hindered by the fact that the process is relatively long and therefore aggressive on polymers, however there is some usage of PVC (usually in liquid plastisol form), Polypropylene and Polyamide (PA6, PA11 & PA12). Many of these non-Polyethylene materials are difficult to grind and most need to be made into powder using cryogenic grinding – that is freeze grinding, which is a more costly process. There is a welcome increase in R&D to expand the range of materials available to the industry. 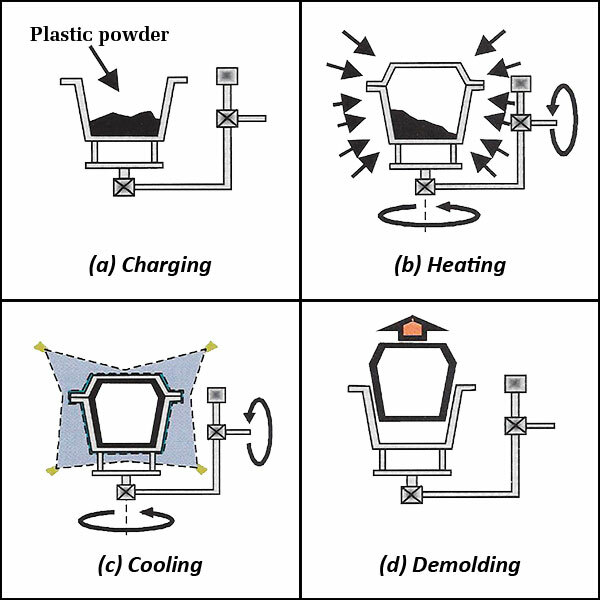 Rotomoulding has several unique characteristics and advantages compared to other moulding processes. Low tooling costs. As this is a casting process there is no pressure. This means moulds are inexpensive and low volume can be economic. If you have a great idea for a new product but don’t know how many you’ll sell or simply want a low volume production run, rotomoulding’s low initial investment makes it particularly attractive. Uniform wall thickness. Rotomoulding achieves consistent wall thickness with corners tending to be thicker. This increases product strength and integrity. Other processes such as blow moulding stretch the molten material at corners or sharp edges creating potential thin spots and weaknesses. Rotational moulding machine costs are low compared to other processes and the investment required is small. There is great production flexibility with the process. 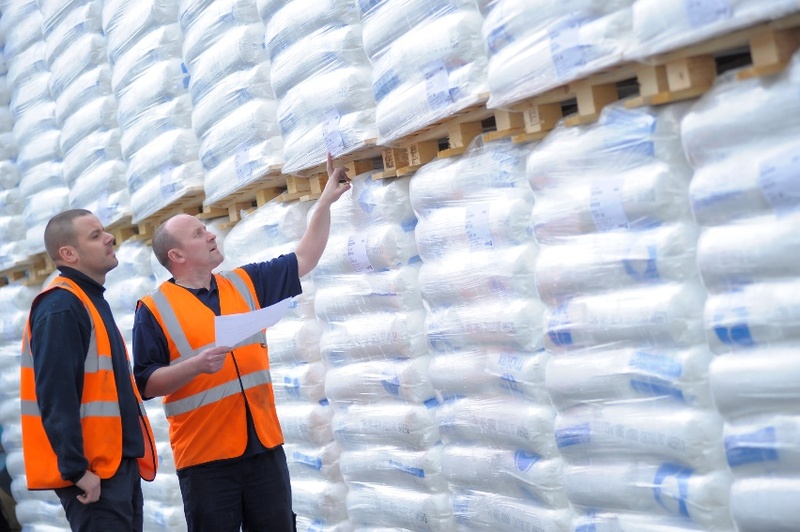 Material handling products such as containers, crates, pallets and insulated fish and cooler boxes. Environmental products which include litter bins, road cones, bollards, traffic dividers and road signs. Automotive products such as truck mudguards, ducting, diesel fuel tanks, toolboxes and tractor dashboards. Products for the outdoors such as garden planters, water butts and furniture. As well as these traditional areas there has been a big growth in demand for innovative, design-led items including interior and exterior objet d’art, lighting and high end decorative products.